Hello everyone! 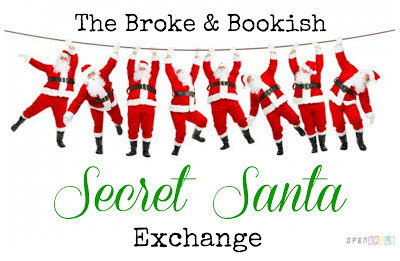 We are planning a Secret Santa exchange again --broke and bookish style. We did it for the past two years and it was a TON of fun and we got great feedback from everyone! We want this to be a low key and fun Secret Santa that doesn't put too much of a damper on your wallet. Please only sign up if you are truly interested and are committed to sending off a package. We have only had a few problems in the past 2 years but I'd like to not have to spend my time chasing people down. We are changing the process around a bit so it isn't so daunting on our end with copying and pasting out of the form and then emailing so please pay special attention to the directions. Please give a few things you like (to help with your goodie). See below for examples in the guidelines. Any questions, comments or additional things your Secret Santa should know. 2. When you receive your Secret Santa, go play Santa and buy your prezzies. Send it out no later than the week of December 6th-10th. The earlier the better as the mail is always slow during the holiday season. 3. After you send off your package, please email TBTBSecretSanta (at) gmail (dot) com letting us know you sent it off and give any DC you may have. Email us again when you receive your package. If you have not received your package by December 27th please then email us. * Books can be new or used. Use your discretion as far as used books go but please be kind and don't send something you wouldn't want to receive. They should be in pretty good condition. Please pick at least one other goody to put in the package. 1 or 2 books + some sort of little goodie or two (candy, bookmarks, something bookish) & a card or note. * Suggestions for things to add that could be helpful to tell your Secret Santa for the little gift: things like music you love, Harry Potter fan, collects keychains, would love something native to where you live, tea fanatic, loves stationary, loves Star Wars, etc. etc. That way maybe they can find something related. *We would love to again have this be open internationally and will make an effort to pair up people from the same countries to keep costs down. However, if anyone would like to do an international exchange, you can let us know. It was hard on some people who had to send internationally but using The Book Depository could be a good option. If you are from outside the US, be aware that you might have to send internationally due to the fact that there are significantly more US participants and we may not be able to pair you up with someone closer. * If you can do delivery confirmation on your package, that would be greatly appreciated to make sure that the package was sent. Also, be sure to keep an eye out for my 3rd annual End of Year Book Survey that will be happening again this year! Last year's secret santa was fantastic, I can't wait to come up with the perfect little present for someone again this year. Oh yay! This sounds like a BLAST :) I'm in! Can you still participate if you dont have a blog? Yes but please put some sort of Twitter account or Goodreads account in place of blog url. Oh how fun! We were just talking about this earlier today! Yeah!!! I did this last and it was a lot of fun!!!! I actually can't afford something like this, but I am going to find a way to make it work. It looks like so much fun! I have never done this and really am looking forward to it! I love Christmas and this makes it just a bit better! Do you need to have a blog to participate? No but please put some sort of Twitter account or Goodreads account in place of blog url. Fun! I'd love to participate but don't have a blog. Is it bloggers only? I'm in too, how fun! Love this idea! Is Canada considered international? Half the time it's cheaper to ship to the States than other provinces! Hmm I haven't really ever thought of it as international but I've mostly paired other Canadians with each other since I wasn't sure how expensive it was to send to the states. You can put on your email if you'd prefer to send it to the States or within Canada. We have a ton of Canadians that participate so there's always enough to pair up. Sometimes I'll get like one person from South Africa and in that case they have to be willing to ship internationally to a place I can find that would be the cheapest. Oh boy! I've been wondering when this was going to appear. I've had such fun the last two years. Must get my email together! This is my first year participating & I'm really excited about it! Books and snail mail... it's the perfect combination. How will we know if you've received our email? I'm just worried it didn't deliver. Just signed up! I'm so excited! Can't wait to participate again! Just sent my email. :) Thanks for hosting this! Just sent my email and can't wait for Christmas. Thanks for hosting this again. This is a wonderful idea! Question: I mainly order my books from The Book Depository so that I don't have to pay for shipping. I would have to send the "extra" separately. Is that ok? Or does everything have to be in the same package? When can we expect an email back? Ah missed the deadline! Fail. Well, awesome idea anyway!! Oh darnit, I missed it...AGAIN this year. I need to be sent out a reminder email or something, seriously. I had so much fun 2 years ago but I keep missing it since.